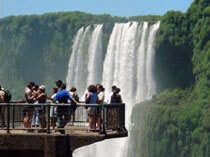 The famous waterfalls of Iguassu are near the three point's border with Argentina and Paraguay. The Iguassu River determines the border between Brazil and Argentina. Some 20 km before flowing into the Paraná River (which is the border between Brazil and Paraguay), the Iguassu crashes over 80 meter high cliffs in a spectacular waterfall, larger, higher and more imposing than Niagara, for instance. The Iguassu Falls are one of nature's most spectacular wonders. The roar of the falls can be overheard kilometers away from the site. The starting point for the excursions is the town of Foz do Iguassu ("Foz" means opening or mouth of the river) which on account of the waterfalls has become one of the most visited places in the world. About 8 km North of Foz do Iguassu is the world's largest hydroelectric plant, Itaipu, which was built as a joint project by Brazil and Paraguay. Nearby, down in Argentina or in Paraguay, ruins of Jesuitic Missions remind us of the early century of the country, when indian pagan tribes were still owners of their land and the priests wanted to convert them to their God. In addition to these regular excursions from Iguassu Falls, we also offer a series of special Interest Tours in the state of Parana.